Spare parts for corroded battery terminals? I own since quite a few years HPS 5 and HPS 10. I have been using them with with a 9V voltage adapter. However, recently I needed them for a quick job and noticed that they did not function when I inserted the alkaline batteries. 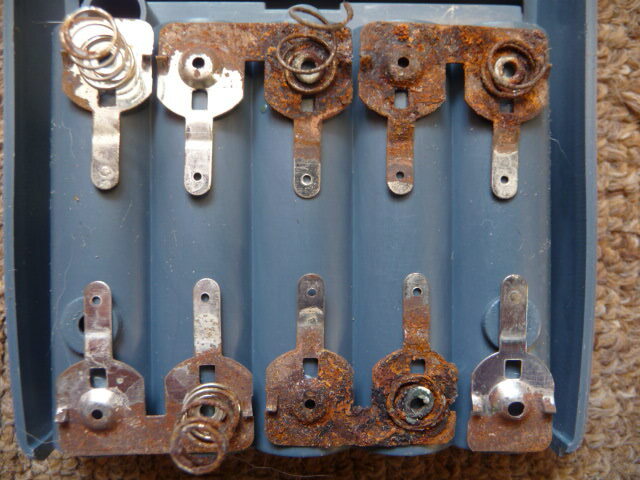 I noticed that some corrosion is visible on the battery terminals, even inside at the soldered wires (It is always hot and humid here). Can I purchase the terminals for both devices so I can change them all? I know that these models are obsolete now, but I’d like to keep them in my mobile test kit. You can ask this at your local Velleman dealer. We do not direct sales. [quote=“VEL456”]You can ask this at your local Velleman dealer. Thank you for your quick reply. I spent a couple of hours in finding the local distributor, which referred me to their head office in Sydney (about 550 km from where I live). They (Jaycar) informed me that they only have one technician who does all repair and service in Australia, ie a very long waiting time once the equipment is out of warranty! So he suggested me to contact Vellemans Instruments in Gavere, Belgium. Any possibility to send the back cover since these contact terminals are easily to be exchanged once one has the proper spares? It could be sent back to my address in the Netherlands. Or, what is the ordering code for these parts? I will ask the repair dept for sush contact. You may send me your complete post address to support@velleman.be. I’m back in the office 4/1. I too would simply like to know the make and model of Battery Terminals used in the HPS5 so I can replace the very badly corroded ones from the scope which was given to me by a friend years ago who left non rechargeable batteries in it which leaked and dissolved most of the springs in the terminals. Otherwise if anyone knows the make and model of these battery terminals I’d like to get the scope autonomous again!